Mardy Gilyard did not have an easy time in his life. He was kicked out of the University of Cincinnati while he was a freshman. The reason was low academic scores. Mardy was a football player and from Florida. On top of that he had his scholarship revoked and owed the school $10,000. At this point, most people would give up, but not Mardy. He stayed in the Ohio area and worked four different jobs to pay back his debt. This was the point where he was also homeless. He slept in his car, a 2002 Pontiac Grand Am. Mardy worked hard and paid back his debt and was reinstated to the school. 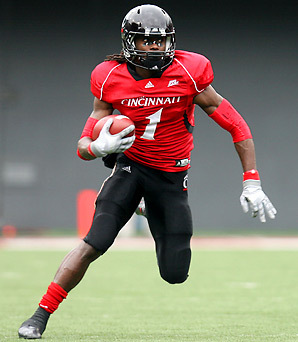 He soon became the leading wide receiver in Cincinnati Bearcats history. Now, 4 years later, he has been picked in the first round of the NFL draft and will be playing for the Rams in St Louis. Mardy Gilyard is a true hero and role model. We commend Mardy and only wish him the best in his career with the NFL.